Sometimes cold cereal just doesn’t cut it for breakfast. It’s hard to get a quick hot breakfast in the morning when you’re in a rush. Then there are the times you’d like a quick breakfast for guests when you’ve planned an early start for a fun outing. 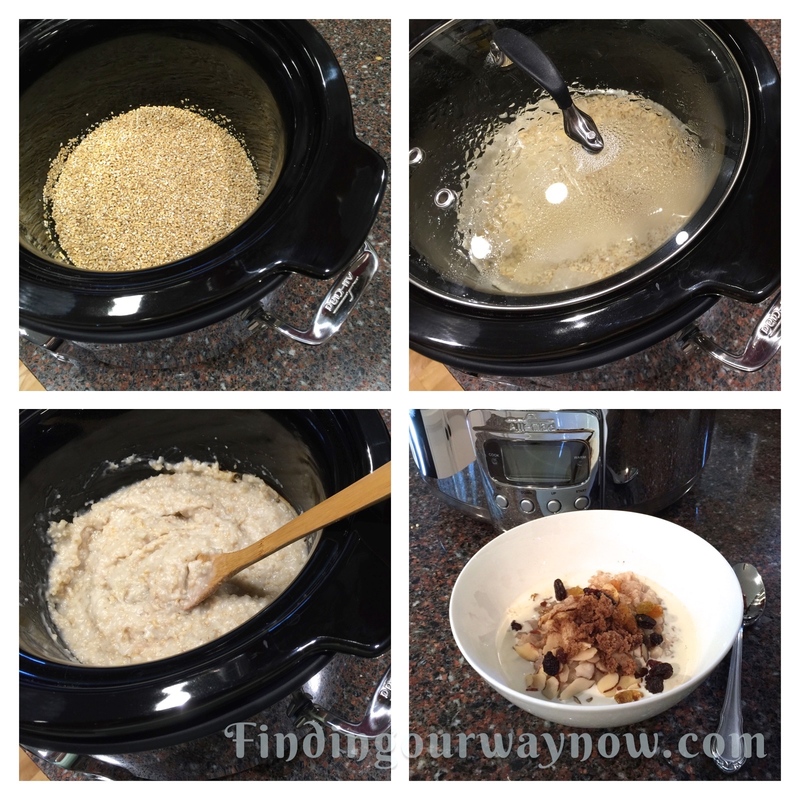 Enter my Overnight Crockpot Oatmeal. I do like oatmeal and all the options that go with it. The hard part is the time it takes to make it. I thought of a few different ways to short-cut the cooking time. I tried most of them. There are many ways. 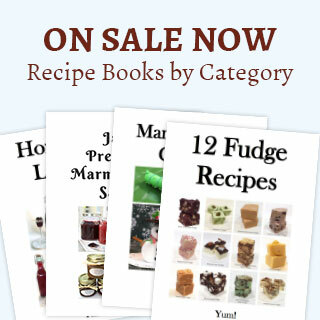 One is the par cook and presoaking method to eat cold or a quick final cooking the next morning. Another is you can always use a pressure cooker. One could always cook it the night before and reheat it the next day or two; that’s way too much trouble. The one I like the best is using a crockpot to make my oatmeal while I sleep. Just before you go to bed, coat the sides and bottom of the crockpot with a bit of oil. Pour oats, salt and water in a 4 Quart Crockpot. Mix to combine. Cook on low overnight for 7 to 9 hours. Remove any skin that may have formed on top and discard. Add the cinnamon and give the oatmeal a quick stir to incorporate. Serve with pitchers of milk or cream and any desired add-ins such as raisins, nuts, fresh or dried fruit, cinnamon and nutmeg and a bit of white or brown sugar. Any leftovers can be refrigerated and reheated the next day. 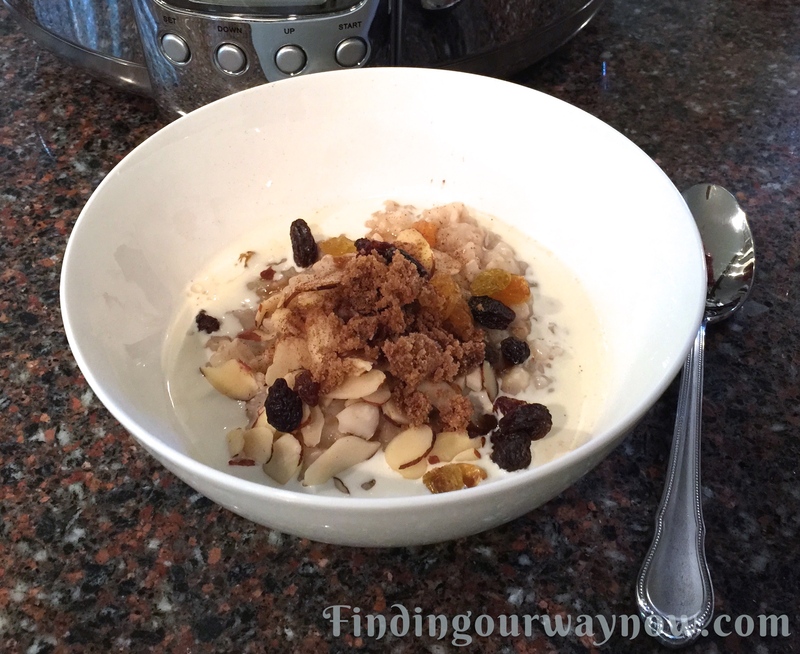 Add In Options to the Slow Cooker: 2 cups dried fruit of your choice such as raisins, cranberries, figs, cherries etc to cook with the oatmeal. A combination of different fruits are fun too. Notes: The longer the steel-cut oatmeal cooks, the creamier it gets. The better the crockpot, the better the results. My favorite all-time favorite crockpot is by All-Clad. It may be expensive, but you will never need another one, ever. It’s worth the price. I’ll often make a larger batch of oatmeal and refrigerate it for the next few morning. 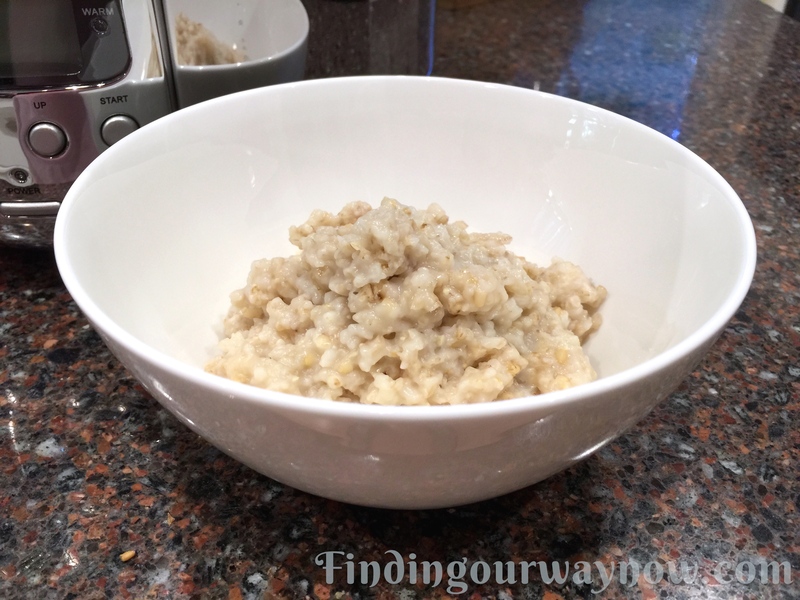 To reconstitute your refrigerated oatmeal, place the amount of oatmeal you wish to eat in a saucepan, add a bit of water and reheat over medium-low heat until hot and you’re good to go. It’s such a pleasure to get up in the morning and have our oatmeal ready and waiting for us. It’s a fast healthy and wholesome breakfast that we enjoy quite often. When we have a larger crowd we set up an oatmeal bar with all the various add-in options. The cool part is, with all the variety add-ins available, everyone can customize their own oatmeal to their liking. If I have a person who isn’t into oatmeal, I offer them my homemade granola or muesli, making everyone happy.